"I felt something grab my kayak and thought it was my dog, it wasn't. It was a big a** crazy beaver." Wherley with the beaver afterwards. 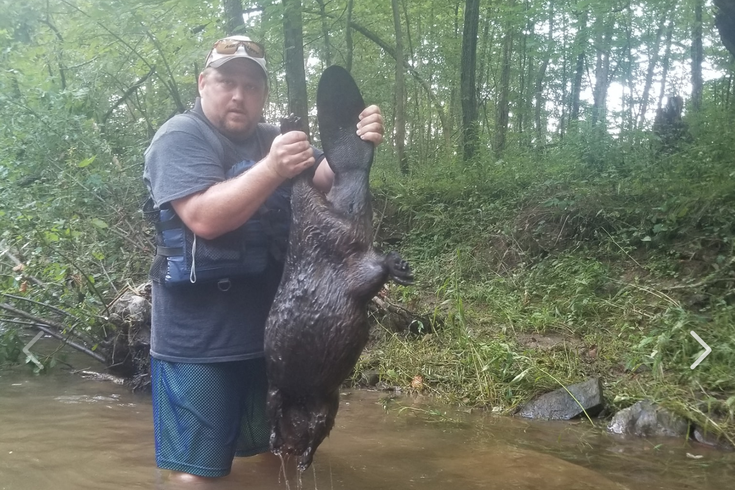 A man and his daughter were spending a day on the Conewago Creek in Adams County last Sunday when a beaver began attacking their kayaks, according to WPMT FOX43. Dan Wherley was kayaking with his daughter, Layla, when the beaver approached the two of them. At first, Wherley told WPMT, he thought it was neat that the animal was coming over to say hi. But when the beaver refused to stop scratching and biting at the kayak, he realized something seemed to be amiss, so he took things into his own hands, fighting the animal off and eventually killing it. It kept trying to bite and get into the kayak after me. I kept beating it with the paddle, this went one for a few minutes. It wouldn't give up. Finally it swam to the opposite side of creek and turned and saw Layla on her kayak who is now 30 yards in front of me. It takes off straight after her. I yell at her to get to the shore, I jump out of my kayak to help. The beaver made to her kayak and started to climb on the back, she was screaming bloody murder. I punched the beaver and knocked it into the water, Layla made to to the bank. The beaver is after me in waist deep water, lunging at me, I was punching, kicking and trying to get away from it. I ran to the bank with Layla and it followed me still trying to attack us. I got a big rock and smacked it on the head drawing blood, it still didn't stop. After about 5 more big rocks to the head it swam away a little bit, then came right back. I grabbed a big stick and smacked it on the head 5 times as hard as I could and the last hit crushed it's skull. Wherley said he contacted the Pennsylvania Game Commission after things had calmed down. He said he’s already received eight shots, and will have three more during the week.